The most comprehensive radio app possible is definitely Livio Car Internet Radio. Boasting 42,000 AM/FM and Internet radio streams, this app is bound to keep you busy, flipping through stations. It is a little pricey at $4.99, but it is a steal compared to Sirius or XM and can be used with an iPhone or iPod Touch. With Livio Radio you get radio streams from all over the world onto your iPhone or iPod. You get 6 spots to store your favorite stations, which you can do using preset buttons. If you are listening to something you love, then you can slide your finger across the screen and the radio will find you a station that plays similar content. To find a station, you go into radio time directory, which gives you the option to search and choose from local radio, music, talk, sports, by location, by language, or podcasts. If you hit music you get a list of 23 genres to choose from with everything from Adult Contemporary to Children’s, and Religious to World. An important feature for this app is that you can have it playing in the background while you do other things; you can access other apps while listening to Livio Radio. Another great feature is the reliability setting, which when turned on, is supposed to only track the clearest stations, so that you won’t hear any static. I only had two problems with this app. To begin with, the telephone feature doesn’t seem to work. It offers an option to call from within the app, but whenever I would try to use it to call someone it would dial out 6855, and give me an automated, “your call cannot be completed as dialed.” The only other thing I found wrong with it was that they do not make it easy to turn it off. It will continue playing even after you have exited out, which happens to be one of it’s good features, but it also makes it so you can’t stop it easily. I can’t imagine buying this app and regretting it. You can listen to the BBC News, a multitude of podcasts, a Parisian hip-hop station, an Algerian news station, a Hungarian jazz station: It’s absolutely fascinating. 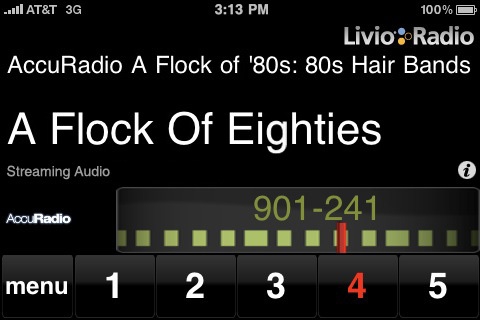 Livio Radio is hands down, one of the best apps I have on my iPhone. AppSafari review of Livio Car Internet Radio was written by Vanessa Paszterko on July 22nd, 2010 and categorized under App Store, Auto, Music, News, Podcasts, Radio, Sports. Page viewed 6898 times, 2 so far today. Need help on using these apps? Please read the Help Page. The developer of Livio Car Internet Radio has been generous enough to provide AppSafari readers with a couple of promocodes for this app. I really like my Livio Car Internet Radio. The only thing I need to say is that now that I have upgraded to the Iphone4s it does not work. Does anyone know of any patch? Posted on January 7th, 2012 at 5:06 pm by Cynthia F.
Posted on January 7th, 2012 at 5:07 pm by Cynthia F.